We don’t do religion, but for us Christmas is a “beanfeast” in the middle of winter to cheer us up. We decorate a tree (along with Hannukah type lights! ), we give presents, we eat a lot on 25th December and have much more sweet stuff than we normally would. 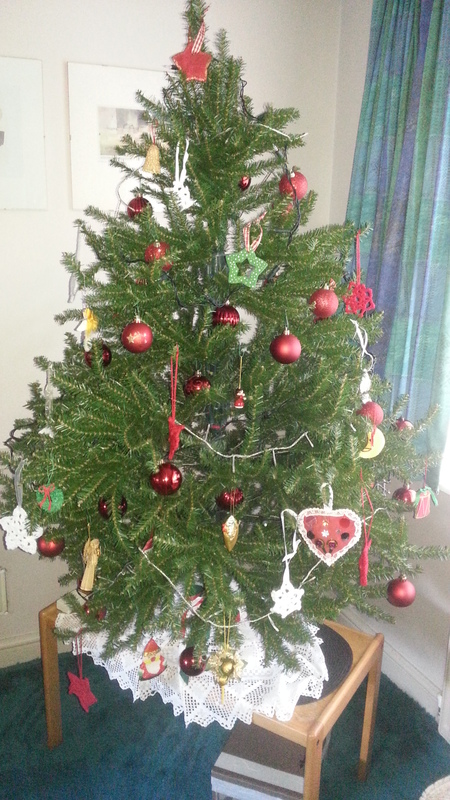 Chocolate, mince pies, fruit cake with marzipan – love it! 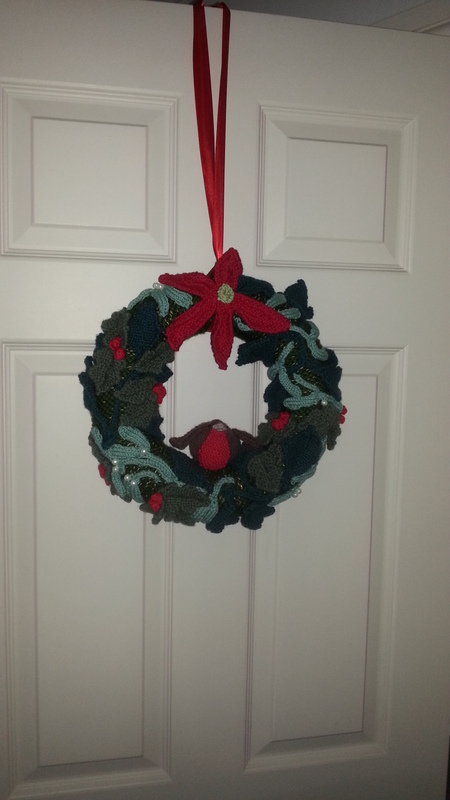 I bought a wreath “inner” from Hobbycraft, knitted a cover, and then knitted ivy leaves, holly leaves and mistletoe to cover it. A poinsettia at the top, a little knitted robin perching on the bottom. And it won first prize at The Shop! I’m so pleased! Feeling very, very tired. Heavy and leaden. Making sure I get a good sleep each afternoon. But I’ve tried to make sure I don’t have much to do each day. Tomorrow – ironing. Monday – nails Calgelled. Tuesday – shopping delivery. Wednesday – bake Raspberry Layer Bake (a sort of posh Bakewell Tart). Thursday – Christmas Day! And that’s it. Until 3rd January when we are having a Hootenanny with as many members of our extended families as can make it. Lovely. So I wish you all Happy Holidays, whether you are humanist, Christian, Jewish, Hindu, Sikh, Muslim, whatever. Enjoy. 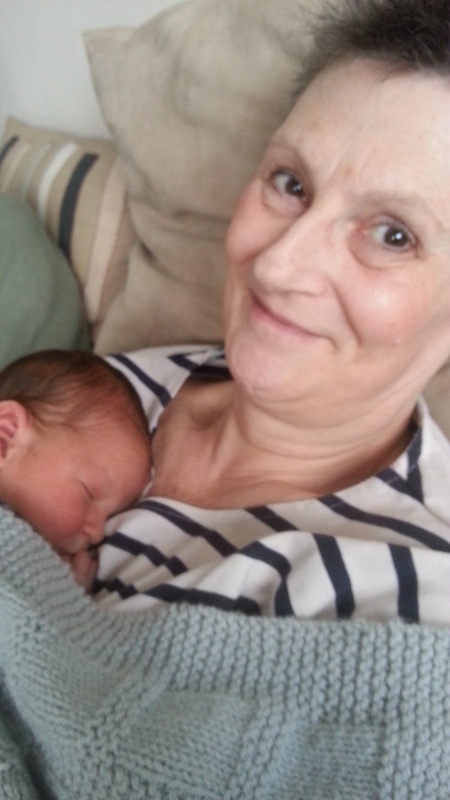 Been to meet new baby Logan. Delightful. Mother and father absolutely wonderful with him. Mother (ED) is a natural. 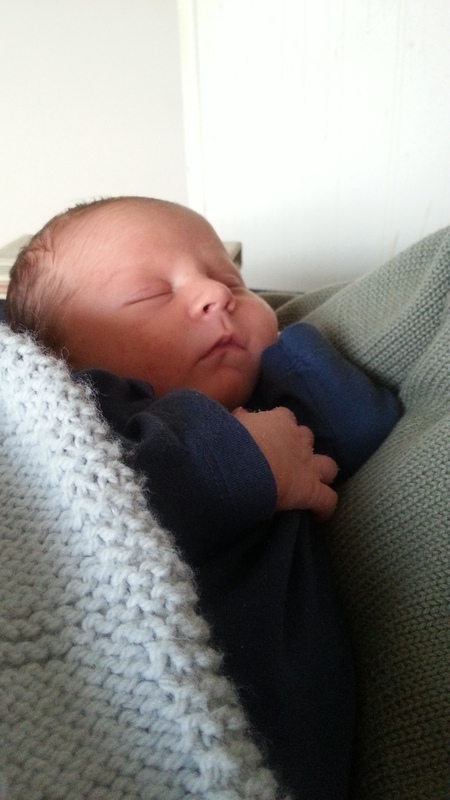 Breastfeeding really well, loads of milk, very contented baby. Sleep deprived parents though 😦 but that’s normal with a new baby. It’s just so lovely to see such a happy new little family. Lucky, lucky baby. He has just the best start in life anybody could ask for. ED is so brave, and so strong, and such a natural mother. She had a horrible time in hospital, but is playing that down. She’s never been in hospital before, ever. She’s healing well and looking fabulous. Logan’s Dad is wonderful with him. So natural and calm. Despite Logan yanking out a handful of chest hair immediately after birth! bless them both! And I do love very small babies. They just smell so nice. They’re soft and warm and cute and like a little parcel, ready for cuddling. Logan has downy dark hair all over his legs! so smooshy. He has his mother’s family’s top lip! and his dad’s nose! And here’s a couple of photos. Three, to be precise. I’m trying not to saturate the internet with baby photos! but he’s just so lovely. The journey down to the south coast was excellent. Fine, sunny day, no traffic problems. We found our hotel no problems, checked in, then off to visit grandchild. Premier Inn – can recommend without hesitation. Excellent value. Lovely room, comfortable bed, really good. Dinner at Prezzo in Eastleigh, watched some AlJazeera news – very interesting, different perspective. Their weather forecast was a little odd though. Australasia and the Far East. Erm? Fabulous breakfast, then back to visit grandchild again. Lovely, lovely, lovely. 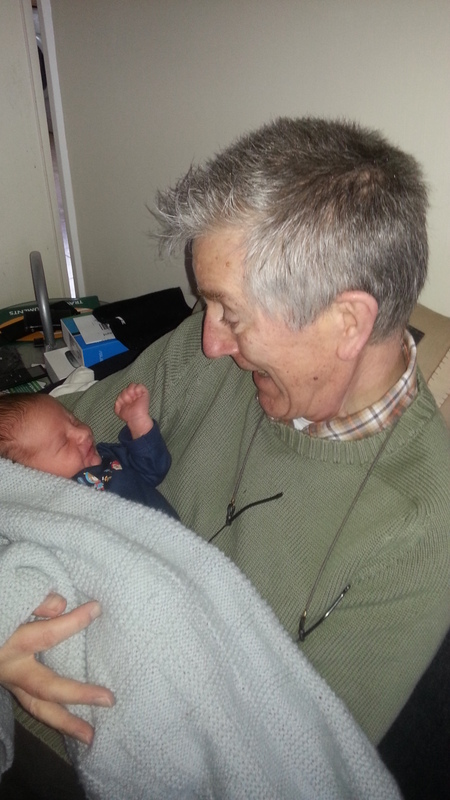 Lots of cuddles, like Saturday, with both me and Grandad. Never thought I’d see the day. And today his other Grandad is going to visit. A baby can’t have too many people to love it, in my view. A happy, happy time for us all.